Happy NHL hockey New Year! 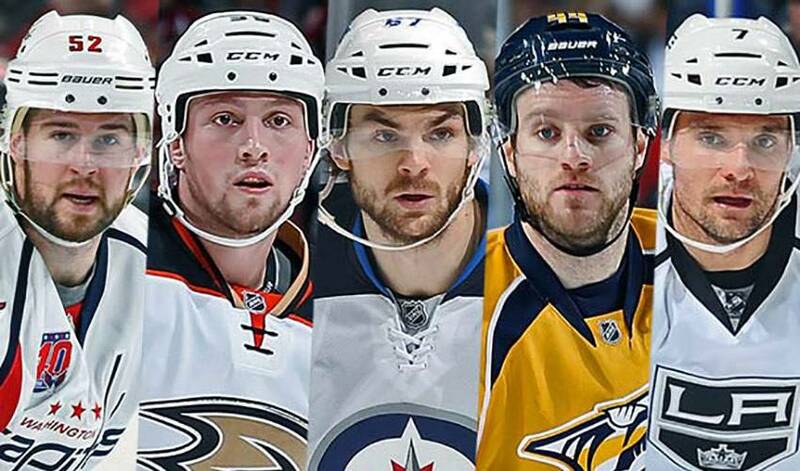 While Canadians celebrate their national holiday, NHLPA members and NHL clubs are busy locking in contracts for the start of the 2015-16 season and beyond, as today marks the opening of the free agency signing period. Players around the league who have reached free agency (restricted or unrestricted) know that July 1st might be one of the most important dates in their careers. With the salary cap set at $71.4 M for the upcoming season, players and clubs know the structure of the marketplace within which they will look to sign. There will be many signings today and in the early days of July, but by no means is this the end of the process. Over the course of the summer months, players will continue to sign and find their hockey homes for next season and beyond. Carl Hagelin, Michael Sgarbossa, Jakob Silfverberg, Chris Wagner. Mikkel Boedker, Klas Dahlbeck, Louis Domingue, Brandon Gormley, Jordan Martinook, Philip Samuelsson, Brendan Shinnimin. Jerry D'Amigo, Jerome Gauthier-Leduc, Johan Larsson, Nathan Lieuwen, Mark Pysyk, Tim Schaller, Philip Varone. Lance Bouma, Paul Byron, Micheal Ferland, Josh Jooris, Max Reinhart, Drew Shore, David Wolf. Zach Boychuk, Rasmus Rissanen, Justin Shugg, Brody Sutter. Marcus Kruger, Joakim Nordstrom, Dennis Rasmussen, Viktor Svedberg. Andrew Agozzino, Sami Aittokallio, Mat Clark, Stefan Elliott, Mikhail Grigorenko, Freddie Hamilton, Calvin Pickard. Matt Calvert, Michael Chaput, Brandon Saad. Louis-Marc Aubry, Mitch Callahan, Landon Ferraro, Nick Jensen, Tomas Jurco, Gustav Nyquist, Teemu Pulkkinen. Brandon Davidson, Tyler Pitlick, Justin Schultz. Jimmy Hayes, Quinton Howden, Jonathan Huberdeau, Corban Knight, John McFarland, Greg McKegg, Alex Petrovic, Garrett Wilson. Andy Andreoff, Andrew Crescenzi, Nic Dowd, Vincent Loverde, Jordan Weal. Jonathon Blum, Brett Bulmer, Mikael Granlund, Johan Gustafsson, Erik Haula, Jared Knight. Michael Bournival, Brian Flynn, Alex Galchenyuk, Magnus Nygren, Christian Thomas, Jarred Tinordi. Taylor Aronson, Taylor Beck, Anthony Bitetto, Gabriel Bourque, Magnus Hellberg, Calle Jarnkrok, Craig Smith, Colin Wilson. Eric Gelinas, Seth Helgeson, Adam Larsson. Kevin Czuczman, Mike Halmo, Brock Nelson, Kevin Poulin, Johan Sundstrom. Mat Bodie, Emerson Etem, Jesper Fast, Marek Hrivik, Carl Klingberg, Oscar Lindberg, Dylan McIlrath, J.T. Miller, Derek Stepan. Alex Chiasson, Mike Hoffman, Shane Prince, Cole Schneider. Beau Bennett, Brian Dumoulin, Bobby Farnham, Reid McNeill, Dominik Uher. Jake Allen, Cody Beach, Robert Bortuzzo, Jani Hakanpaa, Magnus Paajarvi, Vladimir Tarasenko. Aaron Dell, Martin Jones, Daniil Tarasov. Carter Ashton, Vladislav Namestnikov, Philippe Paradis, Luke Witkowski. Nazem Kadri, Martin Marincin, Richard Panik. Sven Baertschi, Adam Clendening, Frank Corrado, Alexandre Grenier. Chris Brown, Stanislav Galiev, Braden Holtby, Marcus Johansson, Evgeny Kuznetsov. John Albert, Julian Melchiori, Paul Postma. The following player is subject to a Club-elected salary arbitration pursuant to Section 12.3(a) of the Collective Bargaining Agreement. He is eligible to negotiate and sign an Offer Sheet with any other Club pursuant to Section 10.3 of the CBA by no later than 5:00 p.m., ET, on July 5, 2015. Francois Beauchemin, Matt Beleskey, Mathieu Carle, Tomas Fleischmann, Korbinian Holzer, Jason LaBarbera, Sheldon Souray. Jonas Ahnelov, Alexandre Bolduc, Andrew Campbell, B.J. Crombeen, Martin Erat, Justin Hodgman, David Leggio, Mike McKenna, Patrick McNeill, David Moss, Dylan Reese, Viktor Tikhonov. Matt Bartkowski, Gregory Campbell, Daniel Paille, Bobby Robins. Drew Bagnall, Andre Benoit, Matt Ellis, Philip Gogulla, Patrick Kaleta, Anders Lindback, Andrej Meszaros, Dennis Persson, Tyson Strachan. Raphael Diaz, Brian McGrattan, Corey Potter, Karri Ramo, David Schlemko, Devin Setoguchi, Brad Thiessen. Brett Bellemore, Patrick Dwyer, Jack Hillen, Ben Holmstrom, Oskar Osala. Spencer Abbott, Cody Bass, Daniel Carcillo, Kyle Cumiskey, Andrew Desjardins, Pierre-Cedric Labrie, Johnny Oduya, Peter Regin, Brad Richards, Michal Rozsival, Kimmo Timonen, Antoine Vermette, Ivan Vishnevskiy. Daniel Briere, Bruno Gervais, Jan Hejda, Jonas Holos, Ryan Wilson. Ryan Craig, Brian Gibbons, Mark Letestu, Jack Skille, Frederic St. Denis. Patrick Eaves, Jhonas Enroth, Shawn Horcoff, Perttu Lindgren, Rich Peverley. Daniel Cleary, Erik Cole, Jonas Gustafsson, Andy Miele, Kevin Porter, Marek Zidlicky. Richard Bachman, Viktor Fasth, Niko Hovinen, Jesse Joensuu, Steven Pinizzotto, Derek Roy. Bobby Butler, Dan Ellis, Dany Heatley, Tomas Kopecky, Shane O'Brien, Scottie Upshall, Greg Zanon. Justin Azevedo, Bud Holloway, Jamie McBain, Robyn Regehr, Andrej Sekera, Jarret Stoll, David Van Der Gulik, Justin Williams. Keith Ballard, Sean Bergenheim, Stu Bickel, Kyle Brodziak, Ryan Carter, John Curry, Devan Dubnyk, Josh Harding, Jordan Leopold, Nate Prosser, Joel Rechlicz, Chris Stewart, Stephane Veilleux. Bryan Allen, Davis Drewiske, Andreas Engqvist, Sergei Gonchar, Joey MacDonald, Manny Malhotra, Mike Weaver. Matt Cullen, Atte Engren, Cody Franson, Kevin Henderson, Teemu Laakso, Joe Piskula, Juuso Puustinen, Mike Ribeiro, Mike Santorelli, Mark Van Guilder, Anton Volchenkov. Steve Bernier, Scott Clemmensen, Mark Fraser, Scott Gomez, Peter Harrold, Martin Havlat, Cam Janssen, Michael Ryder, Bryce Salvador, Tim Sestito, Joe Whitney, Darcy Zajac, Vladimir Zharkov. Eric Boulton, Matt Carkner, Dustin Jeffrey, Tyler Kennedy, Mark Louis, Tomas Marcinko, Colin McDonald, Kael Mouillierat, Michal Neuvirth, Rhett Rakhshani, Lubomir Visnovsky, Harry Zolnierczyk. Chris Bourque, Joey Crabb, Matt Hunwick, Michael Kostka, Chris Mueller, James Sheppard, Martin St. Louis, Pavel Valentenko. Erik Condra, Aaron Johnson, Brad Mills, Patrick Mullen. Carlo Colaiacovo, Ray Emery, Andrew Gordon, Blair Jones, Jay Rosehill, Zack Stortini, Rob Zepp. Craig Adams, Taylor Chorney, Blake Comeau, Steve Downie, Nick Drazenovic, Andrew Ebbett, Christian Ehrhoff, Thomas Greiss, Maxim Lapierre, Pierre-Luc Letourneau-Leblond, Paul Martin, Daniel Winnik. Chris Butler, Patrick Cannone, Adam Cracknell, Benn Ferriero, Colin Fraser, Marcel Goc, Barret Jackman, Olli Jokinen, Jonas Junland, John McCarthy, Zbynek Michalek, Chris Porter. Taylor Fedun, Micheal Haley, Scott Hannan, Matt Irwin, John Scott. Mike Angelidis, Matthew Corrente, Jean-Philippe Cote, Brenden Morrow. Troy Bodie, David Booth, Eric Brewer, Joakim Lindstrom, Frazer McLaren, Colton Orr, Zach Sill, Trevor Smith. Will Acton, Shawn Matthias, Cal O'Reilly, Brad Richardson, Bobby Sanguinetti, Tom Sestito. Chris Conner, John Erskine, Eric Fehr, Tim Gleason, Curtis Glencross, Mike Green, Tim Kennedy, Jon Landry, Mike Moore, Kris Newbury, Steve Oleksy, Aaron Volpatti, Joel Ward, Casey Wellman. Julien Brouillette, Peter Budaj, Michael Frolik, T.J. Galiardi, Matt Halischuk, Will O'Neill, Adam Pardy, Jim Slater, Lee Stempniak, Jiri Tlusty. Chris Breen, Paul Carey, Justin Florek, Jeremy Smith, Niklas Svedberg, David Warsofsky. Matt Donovan, Brett Gallant, Aaron Ness. Carter Camper, Alex Grant, Derek Grant. Igor Bobkov, Ryan Faragher, John Kurtz, Antoine Laganiere, Louis Leblanc. Mark Arcobello, Greg Carey, Darian Dziurzynski, Philip Lane, Michael Lee, Tye McGinn, John Moore, Mark Visentin. Rob Flick, Matt Lindblad, Adam Morrison. Zac Dalpe, Jordan Samuels-Thomas, Kevin Sundher. Sena Acolatse, Ben Hanowski, John Ramage. Austin Levi, Riley Nash, Beau Schmitz, Jared Staal. Jordan Caron, Mitchell Heard, Markus Lauridsen, Tomas Vincour. Luke Adam, Thomas Larkin, Dana Tyrell. Keith Aulie, Tyler Bunz, Matt Fraser, Curtis Hamilton, Brad Ross, Frans Tuohimaa. Jesse Blacker, Michael Houser, Ryan Martindale, Joshua McFadden, Shayne Taker, Andrew Yogan. Jason Clark, Thomas Hickey, Alexandre Mallet, John Persson, Kent Simpson. Nicholas D'Agostino, Eric Hartzell, Adam Payerl. Jon-Paul Anderson, Taylor Doherty, Eriah Hayes, Rylan Schwartz. Mark Barberio, Danick Gauthier, Cody Kunyk, Dan Milan, Dalton Smith. Peter Andersson, Cory Conacher, Joacim Eriksson, Brandon McMillan, Ryan Stanton, Yannick Weber, Michael Zalewski. Brandon Anderson, Edward Pasquale, Patrick Wey. Keaton Ellerby, Patrick Holland, Juho Olkinuora.